*Children ages 4-11, Service charge and tax not included.Advance deposit required to secure reservation. Reservation cancellations must be made 48 hours in advance. Regular a la carte menu will not be available. Seating is limited to 2 hours. Menu subject to change. While supplies last. 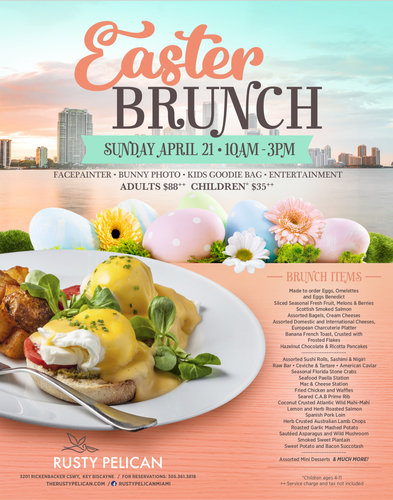 This Easter Sunday, Rusty Pelican Miami has a basketful of Brunch you'll me hoppy over. Bring the whole family for face painting, kids goodie bags, photos with the Easter Bunny and entertainment. Assorted Mini Desserts & MUCH MORE!